RUDN University mathematicians have simulated the work of a cellular network and modeled the use of unmanned aerial vehicles as additional transmitters. Most of the available communication systems have flat coverage and do not take into account the difference in altitude, which results in the appearance of the so-called "blind" zones. Flying drones could solve this issue. The work is published in the journal IEEE Transactions on Vehicular Technology. "Drones have become a promising tool for a variety of applications—from wireless information transfer to delivery of goods. They are of interest as flying access points for cellular network users, and as mobile signal amplifiers. We simulate a communication system using drones, taking into account many features of the real-life situation, including random distances between simulation objects (from drones to users, for instance). We model the system in three dimensions, i.e. in 3-D format, which significantly improves the accuracy of modeling in comparison with the known models. The approach itself—the use of unmanned aerial vehicles—will increase the coverage of the cellular network by about 40 percent," says Konstantin Samuylov, head of Applied Informatics and Probability Theory Department, RUDN University. Cellular communication, which is used by mobile phones, is based on the transmission of information via radio waves. 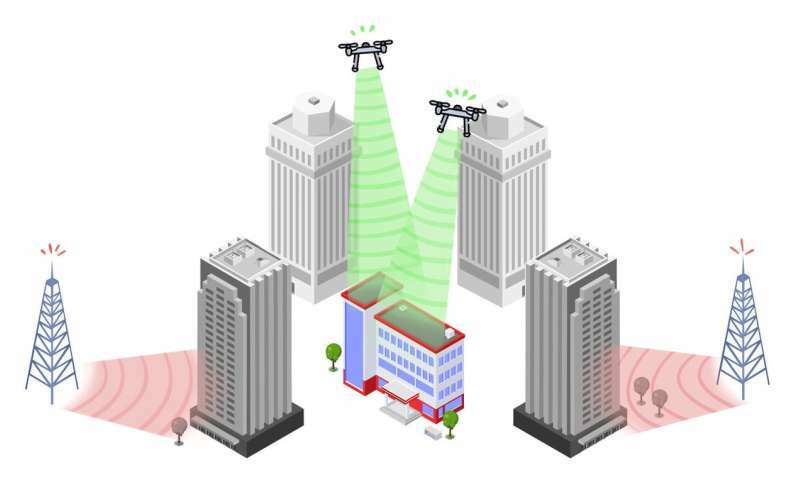 To create a seamless network, the coverage area (for example, a city) is divided into overlapping units, or cells, and a separate base station operates in each of them. These stations are capable of both transmitting and receiving radio waves from mobile phones. The main drawback is that the emissions from the base stations are flat (two-dimensional). That is why quality of communication varies at different heights. Mathematicians presented a model in which flying unmanned drones would serve as additional receivers-transmitters of radio waves and cover areas beyond the reach of conventional base stations. This will significantly improve the quality and reliability of the service. Employing the calculations of stochastic geometry (a discipline at the junction of geometry and probability theory), the scientists built a three-dimensional model of a cellular network that uses unmanned aerial vehicles. They differ from stationary base stations because they use directional millimeter-wave emissions with wider frequencies and higher energy (by two orders of magnitude). Such waves are safe for humans and provide an opportunity to significantly increase the data transfer speed. This is another factor that makes the use of unmanned aerial vehicles effective. As the authors of the paper note, the main feature of the 3-D model is that it takes into account the fact that the receiver-transmitters of the drone and the user are at different heights. This increases the accuracy of the calculations when estimating possible interference. The calculations showed that the interaction between the drones and the user would be most effective if the signal of the UAV is at close to a right angle. In this case, it meets fewer obstacles in the form of buildings and people on its way. The research was carried out by the staff and students of RUDN University together with the colleagues from the Technological University of Tampere (Finland).